Former Wisconsin Football quarterback Alex Hornibrook announced late last evening he is rescinding his decision to transfer to Florida State University and instead intends to lead a new team in Madison. Hornibrook will lead the newly-formed D1 Wisconsin Speed Stacking team with direction from legendary head coach Barry Alvarez. 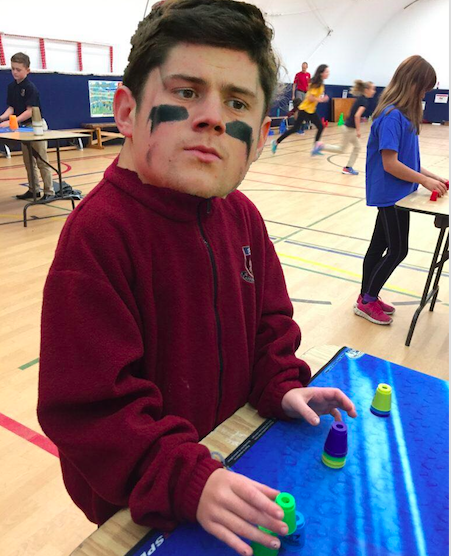 “I am so grateful to Florida State for thinking I’m still good at football, but cup stacking is my passion and I am elated to begin a new Wisconsin tradition with Coach Alvarez,” Hornibrook tweeted. We really don’t have any additional sources for this article, but we’ll fill it with speculation anyway because that’s how the Dirty Bird runs. Cupstacking’s classic competitive events include the 3-3-3, 3-6-3, and the “cycle.” Each refers to the number of cups per pyramid needed to be stacked in a round. While it is often debated if cup stacking is more of an art or a sport, it is clear Hornibrook’s abilities have strong advantages and weaknesses in the field. Let’s take a look-see at his prospects. Obviously, you can’t stack well without pure speed (and not slamming your hands too hard on the sensor so that the pad breaks. The writer of this piece may have done that in their past glory days of competitive speed stacking in 6th-grade gym class). We’ve seen Hornibrook get overwhelmed by speed many-a-time in Camp Randall, yet we aren’t focusing on what really matters here — his hands. The whole rest of the body can be slow in the sport of speed stacking, but nimble hands will assure a successful “cycle”. Given the speed of the ball when it fumbles out of his hands, it seems Hornibrook possesses speed in his hands. There are shapes in cup stacking. For example, a pyramid. Hornibrook has already proven that he can understand shapes, given that he is set to graduate from Wisconsin in May. I think pretty much everyone here knows shapes. That might not be true for Minnesota’s cup team, so we’ll give him a good grade. An often overlooked aspect of the “cycle” is the crucial, accurate touching of the cup tips to the stacking mat. One can easily have their time disqualified if they forget to touch just the tip of the cup to the mat. The cup stacking mat is not to be confused with any other mats or Matts. Since this is an obvious analogous statistics, we can turn to hornibrook’s touchdown to interception ratio to gauge accuracy. The screen of the ESPN website isn’t loading for me to pull up the numbers, but I think he made quite a few boo-boo’s with accurate passes, leading to interceptions. This doesn’t bode well for the critical points of cup accuracy. Cup stacking takes place on a table. That means, you have to bendy bend to stack the cuppy cups. Hornibrook’s 6’ 4” stature requires a big bendy bend of the knees to reach cup height. Luckily, injury records indicate Hornibrook has never suffered a ACL tear, so this is looking fly. Picking the perfect cup stacking set is individualized and has nothing to do with a designated team color. Hornibrook is used to having a uniform designate his color scheme for him. However, we know Hornibrook sometimes suffers with picking colors. Wearing a white polo to a Metallica concert is a choice, but it doesn’t seem to lead to a scenario where Hornibrook picks a fly color for his cup set, like glow-in-the-dark.